Race cars speeding through the streets of Singapore at 200 miles an hour is not something residents of the affluent, but authoritarian, city-state could ever have envisioned less than a decade ago. But this weekend, it became a reality as race car drivers from the Formula One Grand Prix took to the specially created Singapore circuit in the heart of the city. 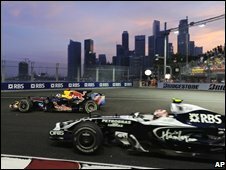 The race disrupted traffic and will cost taxpayers millions of dollars but Singapore hopes the F1 glitz will give businesses a much-needed boost and help the city state promote itself as more than a staid financial centre. Race fans were, for the first time, able to watch a race taking place at night - a key strategy by F1 bosses to target the all important European market where the race was beamed on Sunday afternoon. Renault's Fernando Alonso took the winning spot ahead of Williams' Nico Rosberg and McLaren's Lewis Hamilton, who extended his championship lead despite finishing third. The race took place under 1,500 specially created spotlights, said to be four times brighter than that of those at football stadiums. 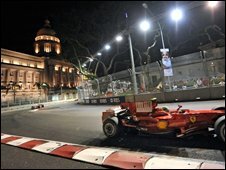 The lights, and the fact that the race took place right in downtown Singapore, slowing traffic for the entire week, meant both the cost and inconvenience of staging it was high. The Singapore government is reportedly shouldering around 60% of the $100m (£55m; 70m euros) annual cost for hosting the event for the next five years. Mr S Iswaran, the trade and industry minister spearheading the event, says F1 would help reinvent Singapore by dispelling its staid and conservative image and boosting the economy. "On the one level, we have a long-term branding kind of value. "In the more immediate economic sense, there's the direct spin-offs, arising from tourism arrivals and related activities... what we've observed is that the fans of the F1 have a rather healthy retail appetite." Businesses - from party venues to corporate sponsors - have looked to capitalise on the event despite the spectre of a global economic slowdown and concerns that the event may have been over-hyped. Amber Lounge is a club created by the sister of race-car driver Eddie Irvine, to lure drivers and their celebrity guests after the race. The lounge is exclusive to F1, and travels with it to its various locations around the world. Sonia Irvine says the Singapore lounge was the first time they erected their own free-standing structure, instead of using hotels. The party took place under a marquee-style tent near the race track. But despite its flimsy façade, entry was by invitation only, and many passes were restricted to those willing to fork out over a $1000 (£554) for a table. "The parties so far have been great and each year everyone says 'okay, that's your best one yet' and that's what we try and achieve." The Singapore race also lured legendary three-time champion Sir Jackie Stewart. Once dubbed the Flying Scotsman for his speed on the race track, he is now flying the flag for the Royal Bank of Scotland as their F1 ambassador. Despite the capital involved RBS continues to be a key sponsor with its own team, despite being hit by the global credit crunch. This could mean potentially less money going into the sport in the years to come. "You're talking about the world's biggest capital investment sport," Mr Stewart says. "Asia Pacific is very important now and Singapore bringing a night race adds a whole new dimension." So, are the sponsors getting worried? James Thompson thinks not. He is the marketing man for drinks giant Diageo, whose Johnnie Walker brand is global sponsor of F1. He dismisses claims that the economic crisis will take the gloss off the event. ''Obviously we have to be aware of the business environment we're in," he says. "We're not seeing anything that unduly worries us. We have a portfolio of brands that we believe is more than capable of withstanding anything within the environment." Beyond the global brands, local names were keen to use the event to gain more recognition on the world stage. SingTel, one of the city state's biggest companies, was the sponsor of the race in Singapore - one of 18 races worldwide in the 2008 grand prix season. "We're really using the event to target business decision makers and to target them with creating awareness of SingTel as a high profile brand," said chief executive Allen Lew. Beyond all the spin, criticism has dogged the event from the start. Many locals questioned the tens of millions of taxpayers dollars the government has spent. The race was officially sold out but many tickets went to corporate hospitality. And in the days leading up it there were reports of hotels slashing rates amid sluggish demand, and of unused tickets changing hands for less than their face value. And, to top it off, the threat of global recession may well be enough to keep tourists and residents from parting with too much cash after the noise and fury of the cars die down.